Sgt. 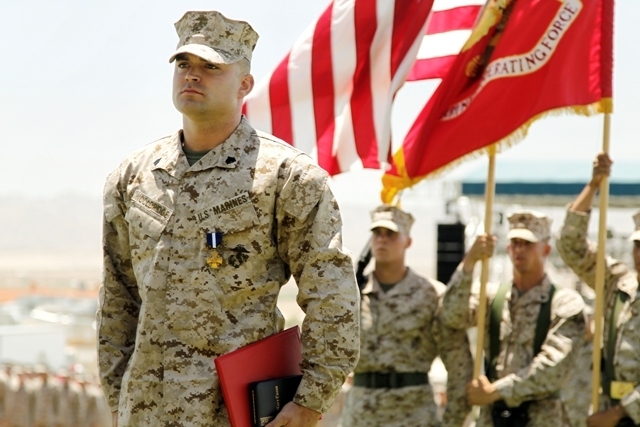 Clifford Wooldridge, combat weapons instructor, Marine Corps Security Forces Regiment, Chesapeake, Va., stands at attention after receiving the Navy Cross Medal, May 18, at Lance Cpl Torrey L. Gray Field. He earned the medal for combat actions in Helmand province, Afghanistan, while attached to 3rd Battalion, 7th Marine Regiment, in 2010.